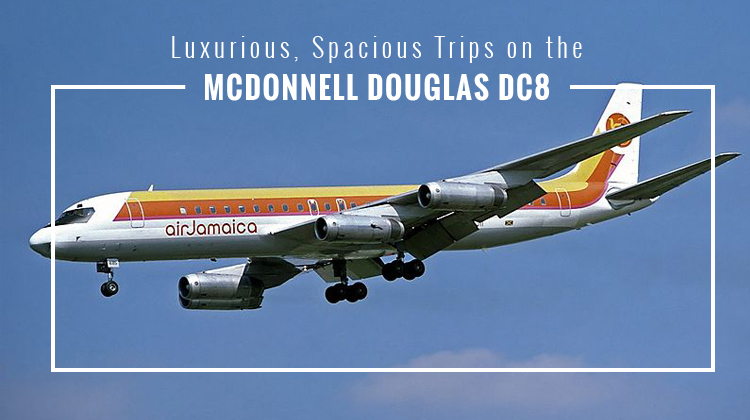 If you’re flying on a 5-hour flight, you might as well do it in style and in the most luxurious ways possible on the McDonnell Douglas DC8. With this aircraft, you can conduct meetings, read through your emails or just lounge around with your drink in hand. Since this plane has space which can accommodate up to 260 passengers, one can only imagine how many features may be added in its cabin. Thus it’s best for you to confirm its exact facilities with your chartered service. This way, you can gauge and plan the activities you can enjoy on board. Flying from Toronto, you can reach as far as Hungary, Italy, Poland or Austria upon riding the McDonnell Douglas DC8. Its standard passenger seats can usually be reclined and has pull out tables on the side. These tables may be used for travelers to relish their meals, or they may function as platforms where your laptops may be placed. Know more about the specifications of your prospective McDonnell Douglas DC8 and reserve for your very own, private flight soon. Traveling for 5 hours or so is best done in style, with all the complete amenities you’ll need. A customized McDonnell Douglas DC8 will be filled with comfy chairs and in-flight entertainment systems. The aircraft also has a galley packed with small appliances (such as a microwave oven and coffee maker), cutlery and other materials for food preparation. Some charter services include wine and other alcoholic beverages in their bars. Its standard lavatories are made with sleekness to ensure comfort throughout the flight. Be sure to confirm the customized details of your plane, so you can make the most of your flight aboard the McDonnell Douglas DC8. The McDonnell Douglas DC8 is exactly what you’re looking for, if you’ll especially need to reach much farther, international destinations. Did you know this giant plane can reach its maximum altitude within just 19 minutes? Despite its large frame, it has a competitive performance in comparison to small and medium sized planes. Would you like to reach the farthest destination within the fastest time possible? Then it would be important for you to confirm your allowable number of passengers and weight of baggage with the operator. This way, they can place the best feasible details of your schedule and itinerary on the flight plan. Keep in mind, a lighter large plane allows for you to reach the farthest destinations within the fastest time possible. First flown in 1958, the McDonnell Douglas DC8 has about 556 units built and flown all around the world. It was built to compete with the Boeing 707. The same aircraft also has other variants to function for other applications. These variants particularly have cabin, engine, fuselage and other forms of adjustments.